We have helped businesses to gain over 2 million new followers and 2 billion impressions on social media - organically! Over 1,25,000 marketers & businesses in 50 countries use Viralwoot daily. Try ViralWoot and make a difference. 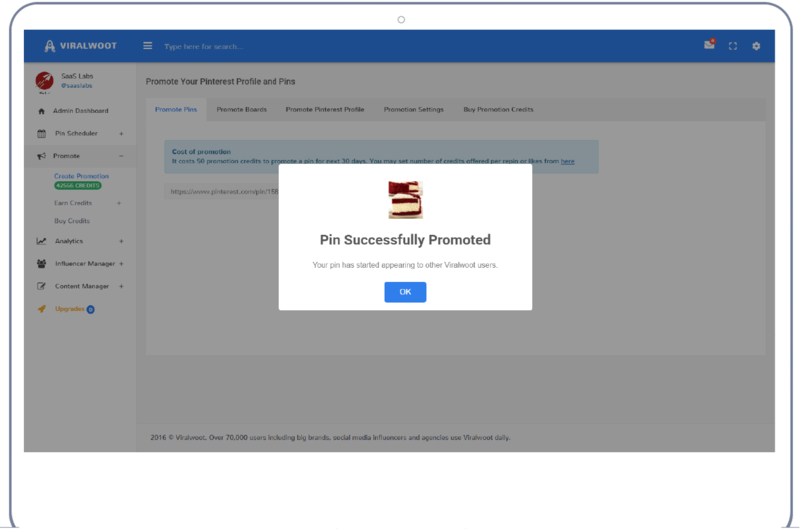 Increase your reach by scheduling Pins for maximum exposure. Get discovered by thousands of active Social Media users across all types of niches. Create mutually beneficial relationships with the movers and shakers on Social Media. All the tools you need are right here. Schedule Posts, increase your reach, engage with the right influencers, analyze the competition and create campaigns. Kick your Social Media marketing into overdrive. Schedule your Pins for maximum exposure. 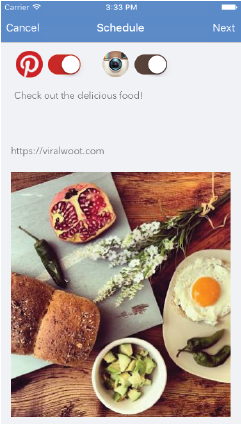 Automate your Social Media presence with ViralWoot's Pin Scheduler, so you can spend more time on high-value activities like engagement. Scheduling Pins in bulk saves time and extends your reach by posting at the right time for maximum impact. Our free chrome extension lets you schedule Pins from anywhere on the web. Boost your presence and get more traffic from Social Media. Simple, fast and easy. Save time and become a more productive, powerhouse Pinner. Get more likes and repins on your pins. Increase your reach on Social Media fast, in a naturally organic way. Learn what works and what doesn't. We even provide guidance on how to improve your metrics. 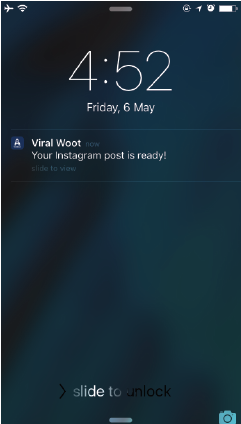 Track your Social Media presence, virality and reach with our analytics feature. Discover your top performing boards, pins and connect with your influencers. 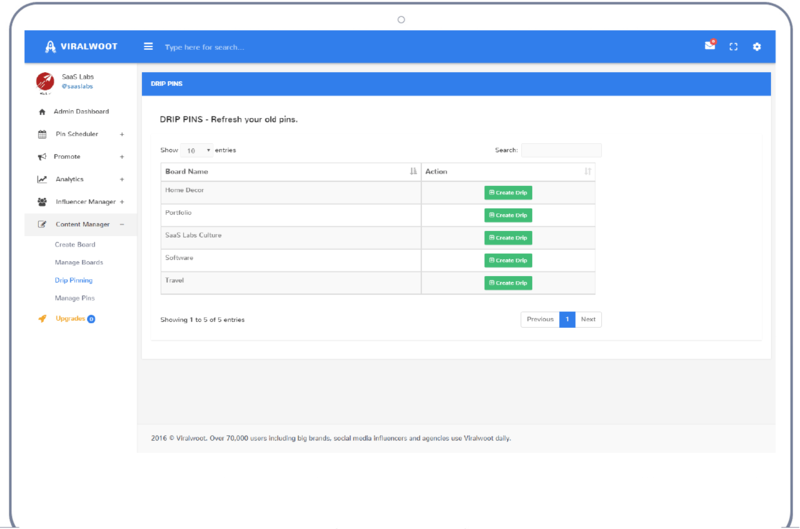 Create and manage boards and pins using our bulk editor. 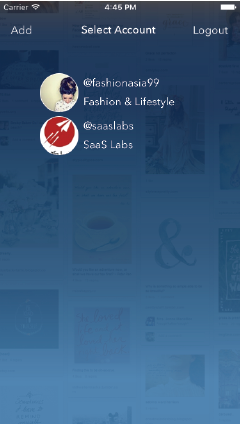 Automatically rotate & republish your old pins and auto post new pins. 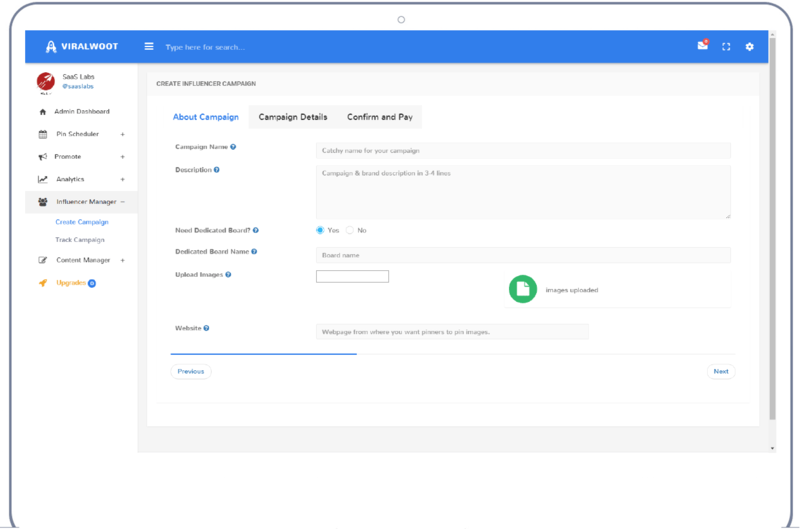 Create Campaigns That Get Results. 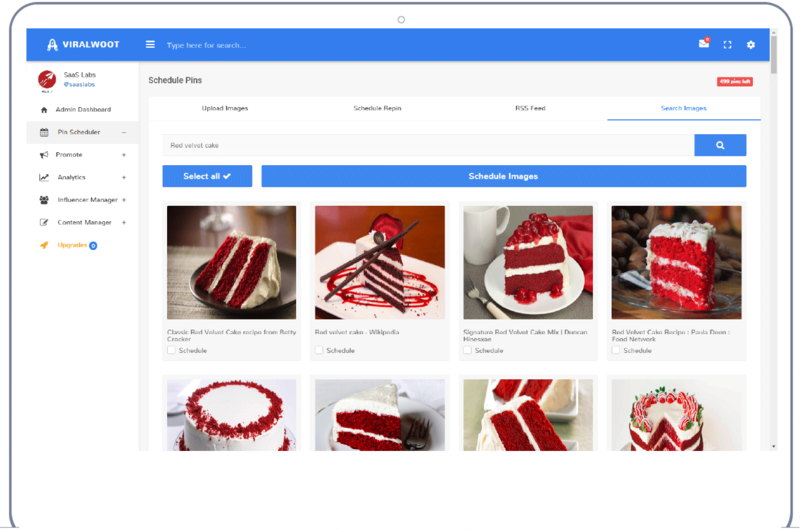 Create category targeted and real-time trackable contests/campaigns. ViralWoot users get pinged about these campaigns and can easily participate and claim their rewards. All Influencers Are Not Created Equal. Discover those Social Media influencers who can help you most and spend time engaging with them. No credit card required. Upgrade or cancel anytime. Over the past four months, I have seen my referral traffic from Social media go up by approximately 50%, every month. A Super Easy Tool to Snag More Followers on Social media and Build your Social Network. Pinterest marketing everywhere you go. Get connected anytime. Grow your Social media presence on your terms. 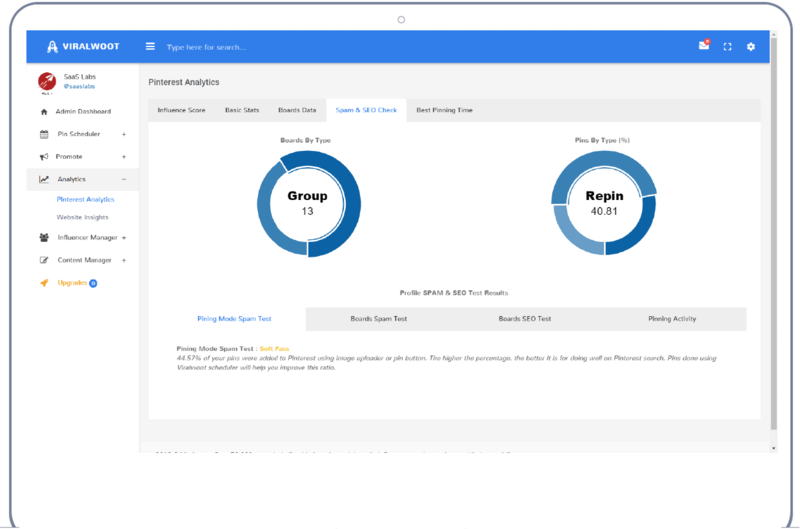 Promote, schedule pins and analyze your results wherever and whenever you want. Even more convenient! Get discovered by over 125,000 active Social Media users. Easily schedule Pins to keep your brand front and center. Gain insight into what works and what doesn't. Discover breaking trends and track the competition. 125,000 happy users and growing. Struggling with Social Media marketing? Try ViralWoot and make a difference. An excellent way for bloggers, marketers, website owners and agencies to promote Viralwoot and generate revenue. © Copyright 2018 ViralWoot. All rights reserved.